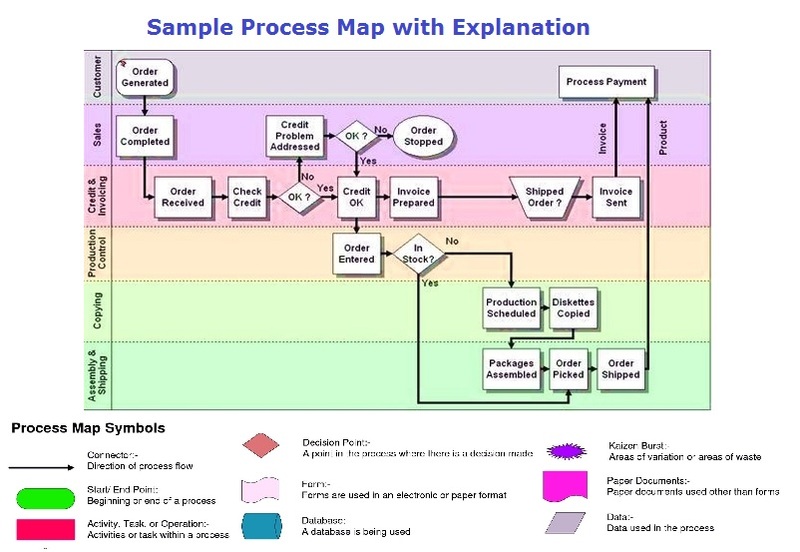 Process Map – Process Map Analysis – Process Map Framework – Process Map Business Methodology – Process Mapping is a tool to documenting business processes and is an effective way to think about the inefficiencies associated with each process step. Process mapping is used as part of the Lean Six Sigma toolkit. There may be few process levels with Level 1 usually representing the high level view, level 2 is more detailed with level 3 focusing on procedural. Key process map symbols include boxes, which represent steps and procedures, diamonds are decision points. Below sample image is an examples of a Process Map used in business management with legend and explanations on what each symbol means.